From compositing in After Effects to editing in Premiere Pro and encompassing all in between including Photoshop, Lightroom, Audition, and more, BOXX builds the fastest workstations, computers and laptops for Adobe Creative Cloud. If you rely on these popular photo-editing packages, you want to make sure that whatever you purchase, you include an SSD and (for your budget) maximize the amount of RAM. RAW files create a large RAM footprint and opening and saving projects will be accelerated by the speed delivered with an SSD. Any professional GPU from NVIDIA or AMD will provide the OpenCL accelerating used in various filters and spending more on a GPU delivers diminishing returns, so even a basic Quadro or FirePro will suit your needs, unless you need exotic display support for higher resolutions or maximum display arrays. Now tightly integrated with the Adobe Mercury Playback Engine, Adobe Media Encoder CC allows you to create optimized video even faster, add effects directly from within AME, and render multiple projects in the background for an efficient creative workflow. 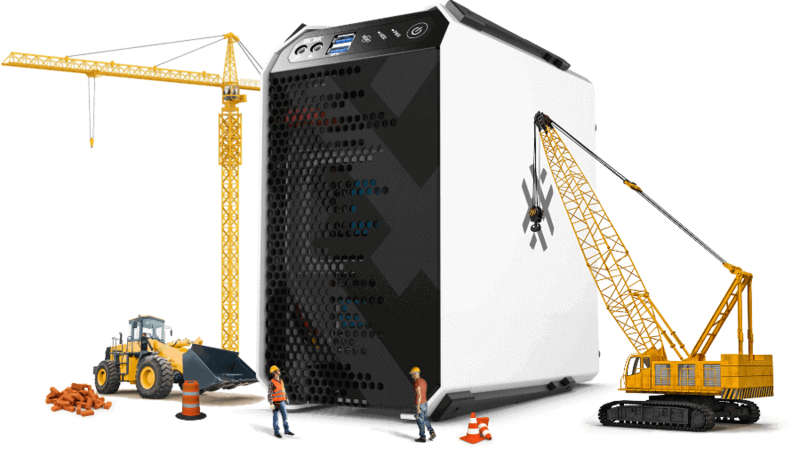 Rendering locally on your machine can keep you waiting, but AME’s queue management helps optimize your workflow from the software side while powerful BOXX overclocked workstations deliver all the performance necessary from the hardware end. As always, BOXX keeps you creating and not waiting. While they often go hand in hand, these two applications utilize your system in slightly different ways. CPUs: Encoding and rendering previews are a CPU intensive process, so the main control you have over export times is to have the fastest CPU possible installed in your computer. Both Premiere Pro and After Effects are lightly threaded during the encoding process. This means that, depending on the project, encoding can make use 4 to 8 CPU cores. Our overclocked 8th Generation Intel® Core™ i7 based workstations are the fastest way to speed up this process. GPUs: A GPU of any type does not assist the actual encoding process (outputting a file to your computer), however, it can improve the processing speed of some effects prior to encoding. In some cases when exporting, the GPU is barely used for acceleration, if at all, when GPU accelerated effects aren’t used. Multiple GPUs: Both applications won’t see much benefit from multiple GPUs when scrubbing and editing footage in the timeline, but Premiere Pro can certainly benefit from multiple GPUs if your workflow makes use of the Mercury Playback Engine’s GPU accelerated effects and footage scaling. Please refer to this article from Adobe for more information. Real-time, professional color grading in the Lumetri Deep Color Engine can also be accelerated via the GPU while Adobe SpeedGrade CC’s GPU-accelerated Look Manager allows you to easily organize and access grading presets. Integration within Premiere Pro CC enables pre-defined Looks to be applied directly within the video-editing workflow. You can also simplify the tedious, time-consuming task of matching clips with the GPU-accelerated Shot Matcher. SpeedGrade lets you automatically correct for subtle differences in footage to achieve a consistent feel between clips, within scenes, and across your entire project. NVIDIA Quadro GPUs deliver the real-time color necessary for RAW, High Dynamic Range, or Stereoscopic 3D content with the Lumetri Deep Color Engine. This means you can color correct multiple layers and design your looks more efficiently and quickly.